The Act codifies and consolidates large parts of existing caselaw and statute, specifically in relation to the defences of ‘justification’ (now ‘truth’), ‘journalistic qualified privilege’ (now ‘publication on a matter of public interest’) and ‘fair comment’ (now ‘honest opinion’). The latter two defences have been modified and are not mere codifications. Amongst other provisions, the Act establishes (or codifies) a ‘serious harm’ threshold for bringing a defamation claim and introduces a ‘single publication rule’ (potentially of great significance to online publication) and a new defence for website operators. The Act also reverses the presumption regarding mode of trial – to judge rather than jury. The Act is considered in more detail below. Section 2 is effectively a rebadging of the defence of ‘justification’, whereby ‘…it is a defence to an action for defamation for the defendant to show that the imputation conveyed by the statement complained of is substantially true‘. Save for the wording, the old defence and new defence are effectively the same. Section 3 abolishes the common law defence of ‘fair comment’ and replaces it with the defence of ‘honest opinion’. Whereas with the defence of fair comment there was a requirement that the words complained of be on a matter of public interest, there is no reference to the public interest in the new Act. As with the previous law, a careful analysis of the words in question will be required to determine whether a statement is an expression of opinion or an assertion of fact. There is extensive caselaw on this issue, culminating in the Supreme Court case of Joseph v Spiller  UKSC 53 which is likely to be extremely persuasive if not technically binding. It is necessary for the basis of the opinion to be indicated (section 3(3)) and for the opinion to be one that an honest person could hold based on a fact (or anything asserted as a fact in a privileged statement) that existed at the time (section 3(4)). The defence of honest opinion is defeated if the claimant can show that the defendant did not hold the opinion (section 3(5)). Section 4 abolishes the common law defence of ‘Reynolds qualified privilege’/journalistic qualified privilege (evolved from the dicta in Reynolds v Times Newspapers Ltd  UKHL 45) and replaces it with the defence of ‘publication on a matter of public interest’. For the defence to succeed the statement, or part of it, must relate to a matter of public interest and the defendant must reasonably believe that publishing the statement is in the public interest. Whereas under the Reynolds defence, the defendant had to have acted responsibly/to the standard of responsible journalism, there is no express requirement in the Act (or reference to any list of factors similar to those set out in Reynolds). However, the explanatory notes to the Act indicate that the new defence is intended to reflect the common law as set out in Flood v Times Newspapers  UKSC 11, in which Lord Mance stated that it would seldom be in the public interest “…to publish material which has not been the subject of responsible journalistic enquiry and consideration.” By its very nature, the viability of any defence under section 4 will be fact-sensitive and sometimes difficult to assess. Sub-sections 5(5) and 5(6) are supported by regulations. The relevant regulations, the Defamation (Operators of Websites) Regulations 2013, also came into force on 1 January 2014. The regulations set out the form of notice required from the Claimant and the relevant procedure that must be followed by the website operator if he/she/it wishes to utilise the section 5 defence. The detail of the regulations is beyond the scope of this article. They set out what website operators must do to ‘keep the defence in play’. The practical effect of the regulations is that if the notice complies with the relevant requirements then the website operator will either have to handover details of the poster to the complainant (with the poster’s consent) or remove the offending publication within a stipulated timeframe if the website operator wishes to take advantage of the section 5 defence. It is open to the website operator to ignore the availability of section 5 (and any notice served by a claimant) and defend any claim on other grounds (e.g. section 1 of the Defamation Act 1996 or Regulation 19 of the Electronic Commerce (EC Direcrtive) Regulations 2002). Section 5 is an extra shield for this class of defendants, it is not a sword for claimants. On first inspection, the regime under section 5 seems reasonable. The hope is obviously that this will lead to greater transparency on the internet without curbing its creative industry. What this section does not take account of, however, is that a significant proportion of individuals publishing content on the internet may have few assets and suing them may be commercially unattractive if they are unable to meet any adverse costs order. Moreover, many internet ‘trolls’ are vexatious in nature, and may even be happy to engage in tortuous litigation with the subject of their defamatory comments. If the prospective claimant was unable to risk the costs involved in suing a defendant of straw, the website operator would be free to continue to host the defamatory statement in question on their site and, in many cases, to derive some material gain from the statement by virtue of the seekers of scandalous material bringing increased traffic to the site (e.g. by advertising revenue). That situation would seemingly only be defeated if one could show malice on the part of the website operator. That is likely to prove difficult, particularly given the requirement that malice is shown in relation to the specific statement concerned, so that even if one could establish some malicious purpose in the operation of the website, it would not automatically follow that the claim would succeed. Section 6 provides a niche category of the qualified privilege defence to those publishing in a scientific or academic journal, provided that the statement related to a scientific or academic matter (section 6(2)) which had been subjected to an independent review as to its scientific/academic merit, either by the editor of the journal or by one or more other experts in the matter concerned (section 6(3)). Where the privilege is found, the publication of a fair and accurate copy, extract from or summary of the statement is also privileged. The defence is defeated if the claimant can show the statement has been made with malice (section 6(3). This section is aimed at preventing stifling of legitimate scientific debate. One potential problem scenario would be where a website containing a defamatory statement did not come to significant prominence (and to the subject’s attention) until more than a year after the statement was first placed on the internet. In that situation one may consider whether an argument could be made that the publication changed in manner upon the change in the website’s popularity. In this regard, section 5(5) states that the court may have regard to (a) the level of prominence that a statement is given and (b) the extent of the subsequent publication (amongst other matters) when considering whether the publication is materially different. Section 9 provides that in respect of prospective defendants resident outside of the European Union, Norway, Switzerland or Denmark, the Court will not have jurisdiction to hear a libel claim unless it can be satisfied that England and Wales is clearly the most appropriate place to bring the action. The court will consider various factors including the extent of any publication in the jurisdiction (contrasted against any publication outside of the jurisdiction) and whether there has been any substantial damage to the claimant’s reputation within the jurisdiction. This section is aimed at preventing libel tourism whereby foreign claimants choose to sue in England (instead of the most logical jurisdiction) to take advantage of what they perceive to be more ‘claimant friendly’ libel laws. Section 10 states that the Court does not have jurisdiction to hear a defamation claim against a person who was not the author, editor or publisher of the statement complained of unless satisfied that it is not reasonably practicable for an action to be brought against the author, editor or publisher (e.g. they were unknown). In conjunction with Section 5, this provides a further protection for certain categories of website operator, but it could also provide protection to other types of intermediary such as distributors or sellers of magazines. Unfortunately, the Act is not a ‘one-stop’ consolidating Act. 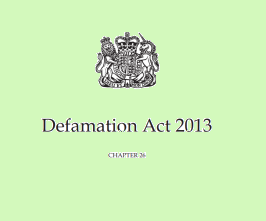 Significant parts of the Defamation Act 1952 and Defamation Act 1996 remain in force and will continue to be relevant to claims. Secondly, and perhaps surprisingly, despite an attempt to codify large tranches of caselaw, the Act does not provide a statutory definition of when a statement is defamatory and/or the cause of action. On the whole, the Act leans in favour of freedom of speech, but not to the degree that some would have wanted.